Though midterm elections night focused heavily on the polarizing politics of a two-party system, the winners of the night–whether republican or democrat–were those of us who know that the United States is a land built by, and for, immigrants. When the newly elected 116th U.S. Congress convenes in January 2019, it will finally look like all of us–not just old white men. Anna Eskamani has become the first American-Iranian woman who will serve in Florida’s House of Representatives. Ilhan Omar, a Muslim Somali refugee, has become Minnestota’s newest congresswoman, and she opened her acceptance speech with “As-Salam Alaikum,” a traditional Islamic greeting. How often does that happen? And there’s more. 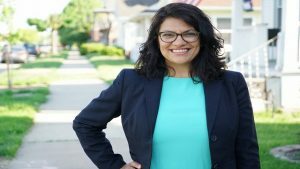 Rashida Tlaib, a Palestinian-American Muslim and former Michigan state lawmaker, was elected to Congress. As a Palestinian-American woman, I’m not sure I can explain how monumental this is. And not just for me, but for women everywhere. Congresswoman Tlaib’s policy on Palestine is what I find most inspiring. Unlike the traditional proposal for a two-state solution between Palestinians and Israelis, she supports a one-state solution, which endorses equality and freedom for both groups. Let that soak in. Thirty years ago, that would have been blasphemous. But times are changing, and history shows that it could work. Prior to the divide and conquer method of foreign policy, Palestinians and Jews lived together, sharing languages and currencies. Ironically, the discourse has returned to the one policy that worked in the past to provide stability in the region. The United States’s declaration of Jerusalem as Israel’s capital showed which side it leads toward. It was directly from the Zionist playbook, much like everything else this administration has done. If President Trump really wanted to do something different, something that no other administration had the “kutzpah” to do, he would endorse a one-state solution. Some fear that the one-state solution means the end of Israel. But it also means the end of Palestine. As with all endings, though, there are new beginnings, and the creation of a wholly inclusive land for all the people, as it once was, would be a great start. Now, the question stands: can the newly elected congresswoman bring the voice of thousands of Palestinian-Americans to the mainstream and make a difference? Although the task seems unpromising, Tlaib seems eager to fight and break the stigma surrounding Palestine and being Palestinian. So, here’s to no borders and no segregation. It worked for Vietnam, Germany, and South Africa. This failing administration could benefit from a “tear-down-the-wall” moment (hint, hint). Not only is this helpful for the Israeli-Palestinian conflict, but also for tearing down the walls in the mainstream consciousness.